Located on Main Street two blocks south of the Union Pacific Railroad tracks, the bank sits across the street from the National Register-listed A. C. Reiff Building. This one-story, freestanding commercial building was erected in 1905 to house the Citizens State Bank, which was later renamed to the Dorrance State Bank. 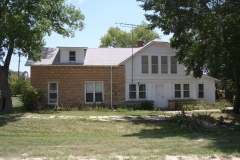 The local bank was a common lending institution for area farmers and merchants during the early 1900s when Dorrance thrived as a small farming community. 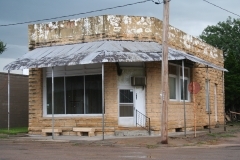 The bank did not survive the Great Depression and the building was sold in 1936. 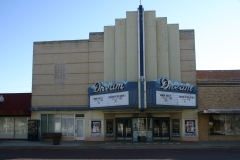 The building was listed for its association with the early commercial history of Dorrance and as a single-story commercial building typical of the early 20th century. The First National Bank-Waudby Building is commonly known as Waudby No. 2 or Waudby and Company Clothiers. It is nominated for its architectural significance built in the Victorian style with Italianate accents similar to the Waudby Pool Hall. The Waudby Clothing Company building is located next to the Waudby Pool Hall, and like the pool hall it was constructed in 1885-1886. The intact, original storefront has a different design than its next-door neighbor, but is constructed of cast iron and wood. 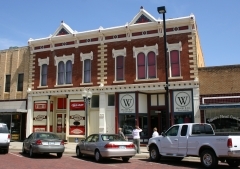 The Waudby Buildings are two separate buildings with different dimensions and function, however they share a common storefront that has been maintained and preserved for 120 years. 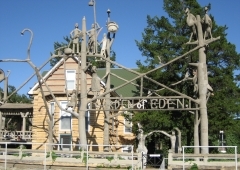 As one of the earliest buildings erected in Paradise, Kansas, the Kennedy Hotel (c. 1888, 1936) is significant for its association with the early development of the community. 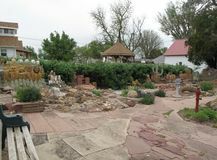 The construction of the limestone hotel in 1888 was documented in area newspapers including the Waldo Enterprise and the Russell Record. Catherine Kennedy, who also served as postmaster, opened her hotel in September of 1888. Although she soon sold the property, the building operated as a hotel until 1913 when it became the private residence of the Samuel Brown family. During the Great Depression, Brown lost his downtown grocery business to a fire. 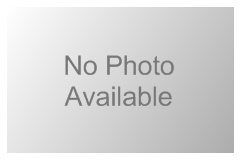 He added onto the nominated property and reopened his business. Since the construction of the original two-story limestone hotel building in 1888, the property changed and evolved to reflect the needs and uses of its first four owners. The changes and additions, all made within the historic period of significance, help convey the history of a property that served as a hotel, grocery store, and private residence.